Hyundai Sungwoo Casting Co., Ltd.
Hyundai Sungwoo Casting handles not only casting materials for motor vehicles but also primary parts of ships, railroad, trains. 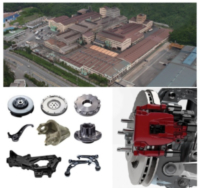 Hyundai Sungwoo Casting continues to extend its realm by carrying out research and development on new materials and technologies as well as cutting-edge facilities and processes. Our challenge that knows no boundaries has unfolded on the world stage for the perfection of Hyundai Sungwoo Casting to elevate itself to the top of the world.